Written correspondence is the physical manifestation of the connection between us and people who matter. 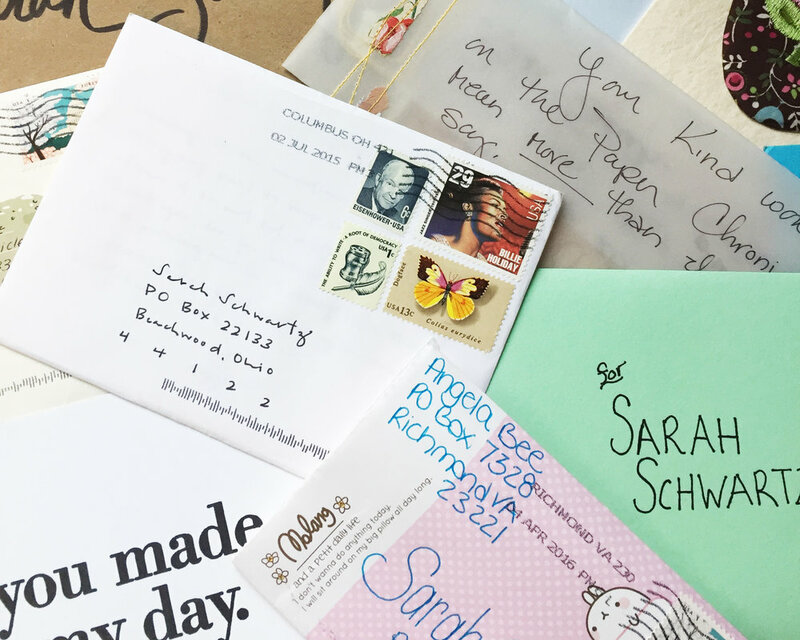 Letters, notes, or postcards are tangible objects we tend to return to over and over again — and, if you’re like us, a lot of these letters have established a special place somewhere on your desk. This week on the blog, Mohawk Paper — they made the paper your Write_On kit is printed on, and are self-proclaimed paper nerds! — asked this question: Why do certain letters stand the test of time? To find out, they asked Sarah Schwartz, editor of Stationery Trends and The Paper Chronicles, to share some of the objects on her desk and why she can’t seem to part with them. Read on to hear from Sarah directly, and gain a glimpse into her paper-rich world. Mohawk asked me to write a #WhatsOnYourDesk post. My assignment: To examine our continuing allegiance to the cards, letters, envelopes and postcards that dress our desks, even as the death knell for paper is sounded by the pundits that make such claims for the millionth time. To my mind, Mohawk couldn’t have asked a better person to write this, as my allegiance to paper borders on addiction. Actually, who am I trying to kid, there’s no healthy border here! You see, I started covering the stationery industry 20 years ago, and that’s given me ample time to accumulate a lot of ephemera. Every piece has a story behind it, and for that reason it’s hard to part with. Further complicating this issue is the fact that there’s a steady stream of paper coming into my office each day. Just when I have a handle on everything, the postman comes and I have a new bundle of treasures. This is so steady, in fact, that if I don’t stay on top of it, the papers threaten to ascend to hoarder-like proportions. This is an easy situation to let fester — it will take a lot of time before I risk injury from a towering pile of letters — but I was forced to deal with it a few weeks back, when we started remodeling my home office. I waited until the last minute before moving my iMac up to my temporary working quarters — our dining room table — and then I had to make a lot of snap decisions about the letters, postcards, stationery samples, promotional pieces and business cards populating my desk. That difficult task completed, and the most precious of the precious safely put away, I was able to face a new day with a mercifully blank slate. This is me we’re talking about, however, so it didn’t start truly blank — that would have been downright depressing. Sugar Paper sent me one of their dreamy planners over the holidays, and not to digress, but it’s made me a planner person. Their chic chambray model — embossed with my initials in gold on the cover, no less — will sit prominently on my desk all year. Just as interesting, however, enclosed with the planner was one of their signature gold-foil-edged and letterpressed flat cards. The message reminds me to watch not just my morning attitude, but my attitude whenever my eyes happen to fall upon it. I’m truly lucky to receive a lot of actual notes, and every one is a glimpse into the sender’s personality and taste. Even for those in the business, it takes a lot of motivation to actually write a note, find my address and mail it, so I appreciate everyone I receive. Over the past few weeks, I’ve received two I’m not ready to put away yet. The first comes from Kalyn of Effie’s Paper, thanking me for including their fun pin in our inaugural Trend of the Month Club at Stationery Trends. I think of these notes as little ego boosts; just glancing at them mid-crisis gives me confidence to put out fires big and small. 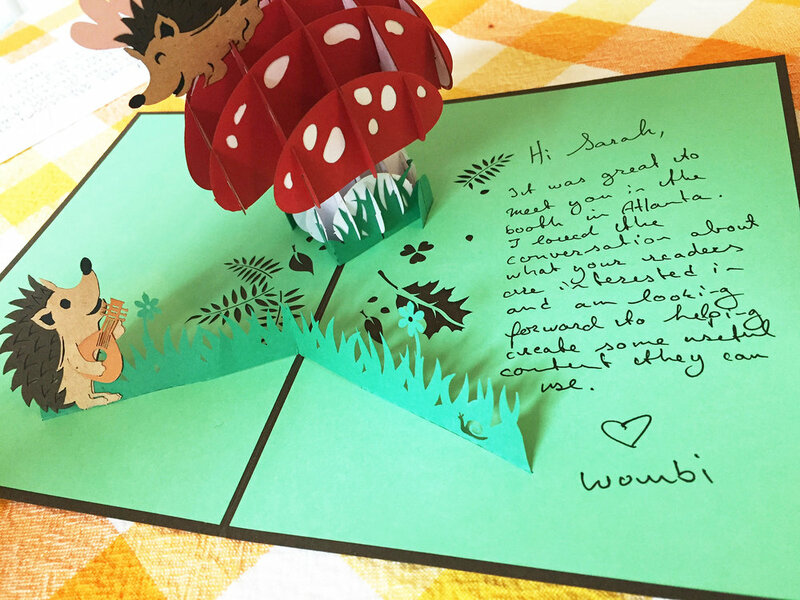 And there’s a note from LovePop’s Wombi, who I met in January at the Atlanta Gift Show. Even though I saw all their magnificent cards in their booth, when it comes to paper engineering, there is nothing quite like taking one of these intricately crafted creations out of the envelope and seeing it come to life in your own hands (with a great message, no less). Finally, my desk tends to reflect my daughter’s school curriculum. Unsurprisingly, I also have a lot of trouble getting rid of her papers — to me they represent a special snapshot of time that will pass too quickly. In a few weeks she’s being tested on the US states, so one of her home practice runs has a prominent spot. 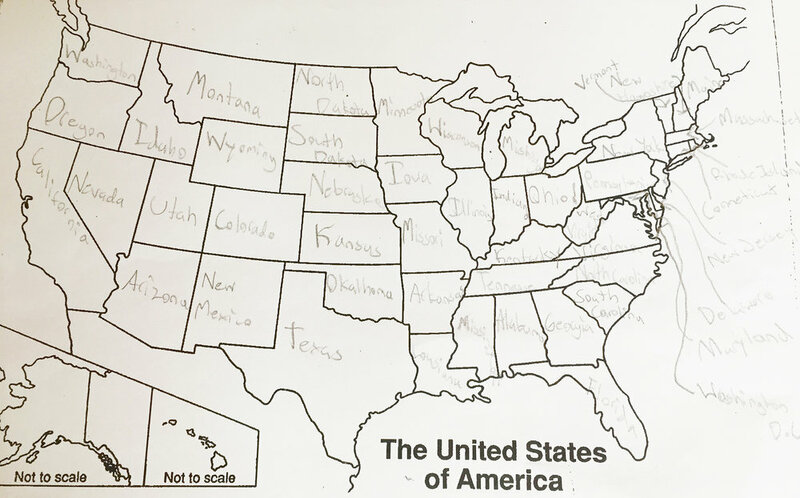 I know I’m not the only Mom with a sentimental attachment to their child’s handwriting — I can almost hear her voice looking at it. What is most magical about the papers on my desk — and yes, I said magical — is that they’re always in flux. As soon as I put a letter away to be mounted in an album someday, another equally compelling missive appears. They keep me company and offer me welcome distraction as I labor away — and always remind me of the possibilities and wonder of paper. #WhatsOnYourDesk: Join along! Share your stories and images about the goodies on your desk using the hashtag.